Navy blue wool Desert short-sleeve shirt from Abasi Rosborough featuring a v-neck, a concealed front fastening, short sleeves, a chest pocket and a straight hem. A Fashiola favorite! You can’t go wrong with a solid collection of men’s short sleeved shirts – find the latest addition to your wardrobe today! 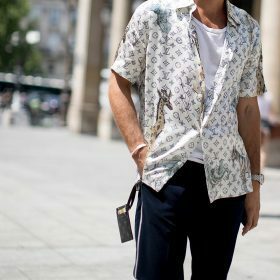 Men’s short sleeved shirts are ultra-relaxed in the coolest way, at Fashiola, we think they’re one of the trendiest styles for men. Discover the range of out-there patterns and prints available for men and hopefully, you’ll be inspired to adopt the trend too. Simply complete the look with a pair of black jeans (you know which fit suits you best) and a pair of classic Clark's boots. Be bold and buy yourself a short-sleeved shirt.